Memorial, I used to know a guy named Davis in mechanic school, I think he stole my wrenches. haha! I guess that's the only thing you need to put up with me about is cracking bad jokes while I work.... Well, it helps take a stressful situation and keep it light. Or you might just want me to shut up and get the job done! haha. Well, what ever the case, auto-mechanics is what I am best at, and that's why I became an auto mechanic in Memorial, TX. I've been a mobile mechanic for 10 plus years and base my business model on integrity and honesty. I treat every customer as I would a friend. I follow the Golden Rule. Do unto others as you would have them do unto you. Your car is a precious possession that is something you and your family rely on to make your life run smooth. I realize that so much depends on your car and unfortunately we don't realize that importance until it breaks down. So I keep all that in mind when you call. I genuinely care, and want to get you back on the road as soon as possible. 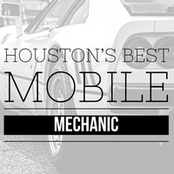 Memorial Mobile Mechanic : 713-497-1202 Mobile Mechanic Memorial, TX.